7-yr old daughter this morning: "Dad, EVERYTHING is easier said than done." An NC show for Superchunk has been added to our September tour dates -- 9/16 at the amazing Nasher Museum of Art in Durham. It will serve as an album release show for Majesty Shredding as well...here's some details. So sad to hear about the passing of Daniel Schorr at the age of 93. The NPR obit calls him a "Journalism Legend" and i don't think it's an overstatement. Mark Eitzel - Brannan St.
and The Love Language live on the radio! on WUNC show The State of Things btw noon and 1 today. Overcast but still hot as Hades, really unfortunate weather. The Boss (the other The Boss) looms large as a figure in my nascent sports fandom; as a kid in Ft. Lauderdale we had season tickets to Yankees spring training games. 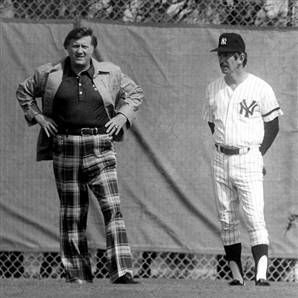 This is probably from 76-79, pretty good years to be seeing the Yankees. You could wait by the players' parking lot, surrounded by a flimsy chain-link fence, and get Mickey Rivers' (favorite Yankee) or Willie Randolph's autograph after the game. I read the box scores in the paper each morning, and remember where i was when i watched Bucky Dent beat the Red Sox in the one-game playoff one afternoon after school. During this time period Steinbrenner was in the news almost as much as the players it seemed, and my dad thought the back and forth between him and Billy Martin, with the hirings and firings, was hilarious. He seemed to soften in his old age (Torre managed there forever, compared to his predecessors), maybe he just wasn't around as much. But he was such a character that despite the fact that he was such a hot-head and a meddling jerk of an owner much of the time, it was hard not to feel some affection for someone so emotionally involved in owning a baseball team. Then again, i never had to play for him. for subscribers to Merge's 20th Anniversary Box Set "SCORE!" (and there are a few complete box sets for sale on the Merge site) you may have seen Phil Morrison's video for the Portastatic song "I Wanna Know Girls" (both the original version from Bright Ideas and also a cover by Lambchop embedded below), which incorporates a new poem (called I Lived Among Girls) by Keith Newton that accompanies the song and kind of runs parallel in a really interesting way to the lyrics. here's a post on My Blog Could Be Your Life which includes the video for the Portastatic version those folks w/out SCORE! hope everyone had a great Independence Day, World Cup action was pretty great though i was pulling hard for Ghana to go through; brutal way to lose. Gonna be sad when it's over.